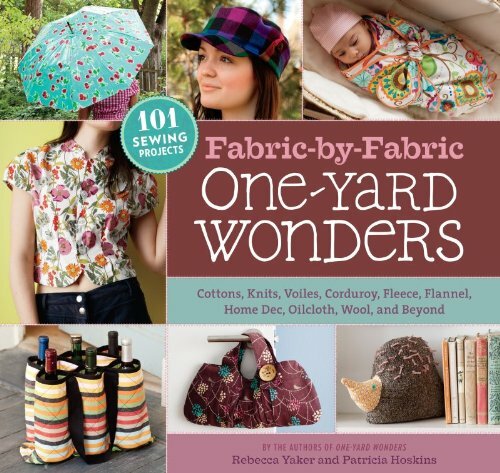 The best-selling authors of One-Yard Wonders are back with an all-new collection of 101 sewing projects that each require just one yard of fabric! This time, the projects are organized by fabric type. From home dec to knits, wool to flannels, corduroy to cottons, these patterns–contributed by popular sewing bloggers and designers from across North America–show how to make the most of each fabric’s unique characteristics. Waterproof coated cottons are perfect for a gym bag, wool makes a warm cap for the outdoor enthusiast, knit jersey whips up quickly into a ruffle scarf or sassy dress, corduroy makes a sturdy farmers’ market tote, and lightweight cotton voile is perfect for a little girl’s smocked sundress. Each project is shown in a full-color photograph accompanied by detailed step-by-step instructions, illustrations, and a complete cutting layout. Too Many Children’s Projects A decent enough book, but sight unseen, I was really disappointed that there are sooo many projects for babies and children. There’s nothing wrong with that, it’s just that I don’t have any little ones to sew for right now. I’d say 85% of the projects are for kids. Wish I had looked at it in a book store before adding it to my wish list. Ladies, I don’t have little ones either. But I am a quilter and a seamstress. I plan on making things and selling them at the local flea market and craft events. It’s pretty simple to just set up and sell your stuff. Or even sell online. At least then you haven’t wasted money on the patterns. Disappointing I loved the original book so I thought I’d like this one too but I was pretty disappointed. Many of the projects are repeats from the previous book. They just changed the dimensions a little and made it in a different fabric. Also, the majority of the projects are baby/toddler items. Based on the titles in the table of contents, it looked like there would be more items for adults and older kids. Most of the items for adults were wristlets and bags that were nearly identical to the ones in the 1st book.If you don’t have the original book, you’ll probably like this one. But don’t waste your money if you already have the other one. I am glad to read this. I’m also glad that it’s being honestly reviewed. Still, I am another person that wants a book with with ” wonders” for women!!! Are there any??!! I’m back into sewing and it feels sooooooooooooo good!!!!! !